Constance Fenimore Woolson was a popular American writer of the late 19th century whose friendship with Henry James has, among James scholars, long qualified hers as a distinctly lesser life. In all the James biographies, Woolson appears as a shadowy presence whose morbid anxieties simply echo those of the Master himself. Now, with the publication of a full-length biography and the reissue of a collection of her stories, Woolson emerges as a figure of some dimension in her own right. She was born in a New Hampshire village in 1840, to a spirited woman who was also the niece of James Fenimore Cooper, and an equally spirited man of charm and literary intelligence who couldn’t make a go of any of the occupations he pursued. These people wanted to be happy, but filial tragedy dogged them. Within a month of Constance’s birth, three of the five sisters who preceded her died of scarlet fever; the other two would die some years later of tuberculosis. After Constance came three more babies, only two of whom lived. All in all, Hannah and Jarvis Woolson buried six of their nine children, and the ones who survived remained infected with a brooding depressiveness that haunted them all their lives. Although she had been writing since childhood, Woolson didn’t try to publish until she was nearly 30 years old. Her work met with immediate success. Very soon—and for decades to come—her stories, essays, and sketches were appearing in the major magazines of the time: Harper’s, Scribner’s, The Atlantic Monthly. Unlike other women writers of her generation who, for the most part, were concentrating on tales of love and marriage, Woolson wrote out of a strong sense of place. Bret Harte, the great storyteller of the West, had been one of her earliest influences; because of him, she thought it fine to set her own stories in the world of the Great Lakes, specifically on the islands and marshlands and logging camps in and around Lake Huron, where the Woolson family had regularly visited when they lived in Ohio. Woolson was enchanted by the protean beauty everywhere to hand, as well as by the many eccentric people who dwelled in the local wilderness areas that she, from earliest youth, had loved exploring. Such was Woolson’s talent that not long after she started publishing, her work was being described as an introduction to a “region as fresh and new as any that American literature has touched.” But very quickly, through an ever-deepening ability to interpret her characters’ situations emotionally as well as geographically, Woolson was also seen to be joining that school of writers—headed by William Dean Howells—whose work was developing the distinctive brand of realism that prevailed in American literature throughout the latter half of the 19th century. Empathetic realism was the name of the game, and for a good 20 years, between the 1870s and the 1890s, Constance Woolson was considered one of the best at it. As a writer, she was an American realist of a high order; at the same time, she was a woman without a permanent home who suffered from serious bouts of depression, the misery of early-onset deafness, and the psychological inability to make a romantic connection. All this she experienced as a humiliation against which she had begun defending herself while still young; by the time she came of age, her armor of defensive reserve was in place. On this score, Woolson suffered doubly. Not only did her reserve separate her from emotional expressiveness; it was also often taken for a constitutional lack of warmth. Her situation was distressing, but distress gave her understanding, and understanding gave her insight. In Anne, her first novel, Woolson’s title character is an otherwise delightful girl whose psychological makeup is marred by a “tinge of coldness.” This coldness, the omniscient narrator observes, originates in Anne’s inability to feel warmly toward herself, and therefore toward others. 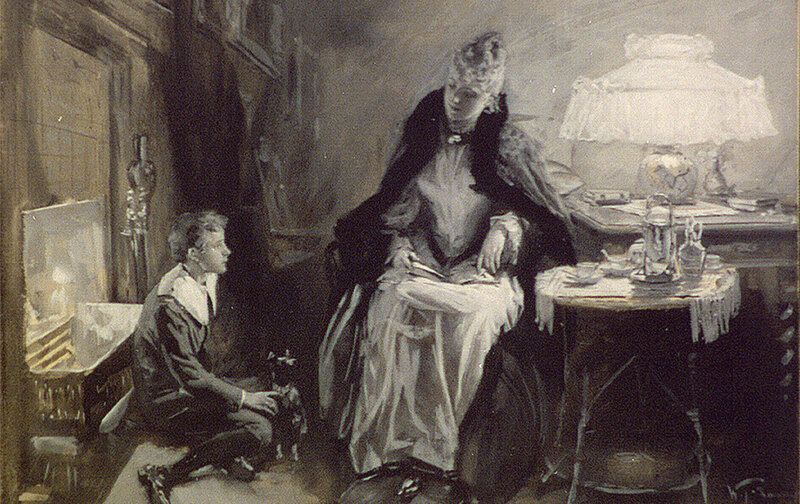 “For warm-heartedness,” the reader is instructed, “generally begins at home, and those who are warm to others are warmer to themselves; it is but the overflow.” In her maturity, Woolson’s “coldness” added immeasurably to all the reasons she had for feeling ever more isolated as the years went on. In 1879, with both of her parents now dead and she herself economically independent, Woolson was free to do what every well-off American of her generation felt compelled to do: undertake the adventure of European travel. Once abroad, her connections were sufficient to put her in touch with the circle of Anglo-Americans to which Henry James belonged, and in 1880 the two met in Florence. James despised the women “scribblers” of his day—especially the ones who were more successful at magazine publication than he—but he met with her when Woolson presented herself with a letter of introduction from a relative of his in the States. To his great surprise, he saw quickly that she was a woman of taste and judgment whose self-divisions mirrored his own. Thus began a friendship between a pair of writers of unequal talent and status who nonetheless experienced a degree of equality in conversation that made them seek out each other’s company with irregular regularity for the next 14 years. In France, England, or Italy, Henry and Constance walked and talked; took tea and talked; went to museums and talked. They talked books, they talked writing, they talked the moral imagination. As both feared impropriety more than death itself, the exchange was not personal in any usual sense; but the intellectual honesty that animated their conversation made each of them feel less alone in the world. Except for the times when it did not. In a Woolson story called “At the Château of Corinne,” a group of Americans make up a house party at a villa on a lake near Geneva. Among them is a woman who has written a much-admired poem that receives a brutal critique from one of the other guests when he learns that she is the poem’s author. “Its rhythm,” he tells her, is “crude and unmelodious, its coloring was exaggerated,” its thesis unpersuasive. But, he adds, all this was to be predicted because “we do not expect great poems from women any more than we expect great pictures; we do not expect strong logic any more than we expect brawny muscle.” A woman’s mind, quite simply, was not the same as that of a man’s—it could not accommodate creative genius—and to see a woman leave her own mental sphere and try to enter that of a man’s was painful if not pathetic. Woolson was writing in an age when the idea of first-rate talent in a woman made civilized men sputter. Henry James, unlike Nathaniel Hawthorne, did not say that women should be whipped before they were allowed to publish, but he shared the prejudice. Woolson’s work had often been cited by critics for its power and originality, but power and originality did not carry much weight with James, for whom fineness of writing and depth of artistic purpose were all. Every now and then, a pursed lip here, an injudicious silence there—and Woolson knew that he did not put a high value on her work. Nor, she felt, did anyone around him. In America, she suspected that the literary elite would always exclude her; in Europe, the conviction sank into her soul. In this regard, Woolson’s friendship with James was as problematic as her 15-year wander in Europe; together, they fed rather than dispelled the gnawing insecurity that was her near-constant companion. But a paralysis of the will set in that kept her moving about the continent until depression of a clinical order took hold and—as depression deprives one of sense as well as sensibility—in January 1894, she ended her life by jumping from the window of an upper-story apartment in a palace facing the Grand Canal in Venice. She was 53 years old. Anne Rioux’s book is a serviceable biography that tracks Woolson’s movements—names, dates, relations, places of travel—from birth to death. It also tells us many things about her. For instance, we learn that 16 years after her father’s death, she still felt desolate; after the Civil War, she thought “the feeling of having truly lived was no more”; and St. Augustine was a place that “would excite [her] imagination for many winters to come.” We are told these things but, unfortunately, we do not feel their import, because Woolson herself does not come alive in the pages of this book. Although Rioux indicates clearly enough that Woolson was not in the market for a conventional marriage, perhaps not in the market for marriage at all, the puzzle of why Woolson could not free herself from the psychological knots within which she was bound is never explored, much less solved. What is missing is a point of view informed by the kind of insight that illuminates the subject’s inner life. Nor, sorry to say, does Rioux offer anything in the way of satisfactory criticism of Woolson’s work. Consider the following on a story published in 1875: “The thirty-four-year-old author put much of her earlier uncertainty and hopelessness into her characterization of Sara, a magazine writer in her late twenties…[who] is unusually sensitive, caustic, and isolated, we learn, because of a broken engagement.” Not once in Rioux’s book does the reader feel persuaded that the failure of a love affair had become a useful metaphor for Woolson. After coming to know—or not know—Woolson through this biography and those of Henry James, turning to her Miss Grief and Other Stories is something of a shock; that’s how unexpected is the punch that much of the book delivers. There are seven stories in all, three set in Europe, four in America. The writing in all of them is remarkably good, but it is the American stories that will send the reader looking for more of Woolson’s work. Those set in Europe have invariably to do with the fate of the failed artist or the emotional artifice of Americans abroad, and are marred by an oddly blurred sense of artistic purpose. But the ones set among eccentrics living in the rural or backwood areas of the Great Lakes or on the Southern coast (almost all published in the 1870s) are told with an authentic directness that carries the tale straight home. The voice in these stories is as clear and fresh as the sound of a bell riding the early morning air in a place of natural wonder. The delight it takes in its surround is transparent; the irony it displays toward the women and men it meets with is lighthearted; the moral it draws from the situation in which the story rests evokes the sheer gladness, if not the awe, of earthly existence. One of the best of these stories is “St. Clair Flats.” The Flats are a vast wetland composed of islands, marshes, and bays at the mouth of the river in Michigan that connects Lake Huron with Lake St. Clair. They are home to a huge variety of waterfowl, migrating birds, deer, and a mass of aquatic life; the area regularly draws hunters and fishermen and others who wish to experience something of the wild. To this day, passenger steamers ply these waters with tourists bound for one or another of the lakes. Woolson’s story is told by one of two young men, educated urbanites who, standing on the deck of the steamer as it makes its tortured way through waters choked with reeds, water lilies, and grasses of all kinds, are enthralled by the scene before them. and yet the reality was as beautiful as anything I have ever seen—an en­chanted land, whose memory haunts me as an idea unwritten, a melody unsung, a picture unpainted, haunts the artist, and will not away. On each side and in front, as far as the eye could reach, stretched the low green land which was yet no land, intersected by hundreds of channels narrow and broad, whose waters were green as their shores…. You might call it a marsh; but there was no mud, no dark slimy water, no stagnant scum; there were no rank yellow lilies, no gormandizing frogs, no swinish mud-turtles. The clear waters of the channels ran over golden sands and…only in a bay, or where protected by a crescent point, could the fair white lilies float in the quiet their serene beauty requires. At the time in which Woolson’s story is set—1855—almost no one ever got off the steamer anywhere in the Flats. But somewhere in the middle of the trip between the lakes, these two men, bent on adventure, launch themselves from the steamer in a rowboat, and here the story begins. Convinced that there is a place and a set of persons who will provide them with bed and board while they spend a few days exploring the marsh—eager as they are to “penetrate far within its green fastnesses”—our two city slickers row out to a lighthouse where the keeper’s wife tells them to try Waiting Samuel’s. Who, pray tell, is Waiting Samuel? He’s the local religious madman, who lives just up the channel on one of the few small islands in the marsh. And what is he waiting for? The Day of Judgment. “Pilgrims, asking for food and shelter,” replies Raymond. “Supper, for instance…and beds,” I said. So the two settle in, and Woolson interweaves the self-mocking rhetoric that is their style—there’s a long, hilarious exchange between them about literary Somebodies as opposed to literary Nobodies—with ever more wondrous observations about their loony hosts until, at last, the texture of Samuel and Roxana’s lives—something strange and marvelous in itself—becomes one with the ever-changing glory of nature itself. Which means the gloom as well as the joy must have its moment. An hour comes when the narrator sees Roxana sitting motionless in her boat, and the deforming solitariness that marks her existence is borne in on him. Suddenly “the Flats looked wild and desolate,” and “God help her!” bursts involuntarily from him. Fifteen years pass before the narrator returns to the “grassy sea,” and when he does, much has changed. A canal has been cut through the enchanted land and with it has come development; development has re­sulted in fewer birds and fish that have “grown shy.” The house on the island is still there, but Roxana and Waiting Samuel are obviously long gone. Were they dead, he wonders, or had “a new vision sent them farther toward the setting sun?” He will never know. “But the water lilies were beautiful as of old, and the grasses as delicate and luxuriant.” He bids the magical place goodbye with the promise that while “no artist has painted, no poet has sung your wild, vanishing charm,” in his heart it would live forever. After a year or two in Europe, Constance Fenimore Woolson should have gone home to the idiom and the landscape that had never failed to inspirit her. She was one American writer for whom going abroad had done infinitely more harm than good.